Beyond Excel: VBA and Database Manipulation - Page 4 of 10 - Everyone knows Excel is a powerful data manipulation engine – but data lives in databases. Explore ways to exploit this natural synergy. The last post talked about a generic validation routine. That routine requires some functions that I will provide code for in this post. These functions convey to users and other routines which cells: can change; have changed, have passed validation; or have failed. Users need this information to know what can be changed and what needs fixing. The other routines need this information to know what has changed and needs checking, and what has passed validation and doesn’t need to be checked again. To convey this information we use a simple technique, color. The colors I use are culturally well suited for my audience: pale yellow for changed but not yet verified; pale green for passed validation; and pale red for needs fixing. You can easily change the colors to suit your preferences and culture. This basically says, make sure entries for the “State/Province” column are in the “States” table where the States Table “Type” equals the “Country” column for each entry. Twenty/Twenty hind sight tells me I should have named the routine something far different. At some point in the future I will. But there’s nothing stopping you from naming it something that makes more sense to you. You’ve got all of the code. Do what you want with it. Today’s post is about a routine I call Check_For_Normal_Entry_Errors. In my opinion, the toughest part of coding is checking for entry errors because just knowing what good values look like isn’t good enough. You also need to anticipate anything a user might do even though it may make no sense for anyone to do whatever that might be. If you’ve been coding end user entry applications for any length of time, you know exactly what I mean. I’m not going to tell you that I’ve solved that riddle, but I do offer some basic validation routines that fit many common entry problems. I also offer the source code so you can fill in the gaps I have left. Check_For_Normal_Entry_Errors is meant to be a function that is never modified for a specific entry problem. It is for ‘general’ entry problems and for that reason is placed in modTableUpdate. 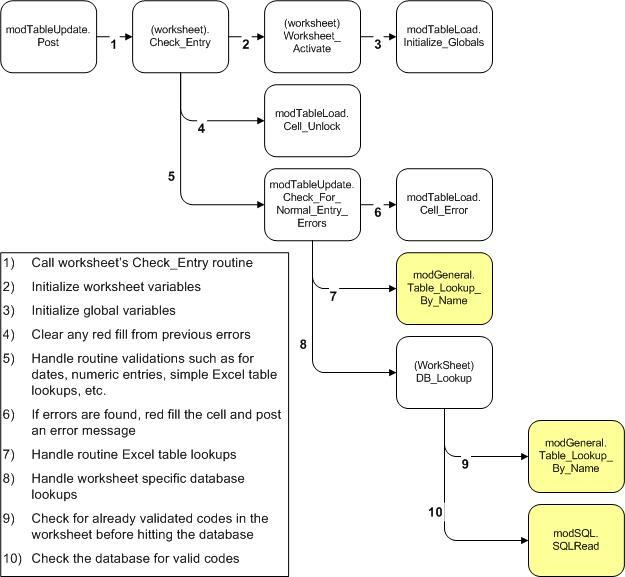 Check_For_Normal_Entry_Errors works in concert with Check_Entry which is a routine meant to be modified for a particular worksheet’s specific validation needs. That routine may have to be modified often; but, not everytime. In the example we are building, we won’t need to modify it. Check_For_Normal_Entry_Errors handles everything we need. There are a few support routines here that I have not yet covered. They are small routines that mark cells in error or as having passed our validation rules. Those will be the subject of our next post. One last note, this routine will never, and should never try to correct anything. ALL this routine does is determine if an entry is valid or not. Now that may seem odd because I spent so much time on frmSelect which is all about helping users correct bad entries. I included frmSelect because it is called by routines Check_For_Normal_Entry_Errors uses, but Check_For_Normal_Entry_Errors tells those routines to NOT use frmSelect for that purpose. Those routines serve multiple masters and when they serve Set_Entry_Defaults, frmSelect will come into play. Just keep in mind that there are times when you want to let the user know their entry is wrong and help them fix it, and times when ALL you want to know is if the entry is ready for posting. Those functions have a lot of overlap, but they MUST be independent of each other. As always, I believe the code’s documentation explains how the routines works so I’ll not duplicate what’s in the code. Here is the code.
' Description:Checks a cell against the most common validation rules. "In ACD: A=Add, C=Change or D=Delete"
" must be a valid date and time"
" must be Y (Yes) or N (No)"
Case Is = "#", "$", "NUMBER"
" must be " & v & "characters or less"
Today we add the code to frmSelect (See: frmSelect Visual Elements for what this form looks like, or frmSelect Theory to see how it works). This code must be added to the form. If you’re not sure how to do that, watch the video in frmSelect Visual Elements and at the tale end is where, in the Project Explorer you’ll see me right clicking on frmSelect and left clicking on “View Code.” In the Code View Window is where you paste all the code provided. There’s a good bit of code but all you have to do is copy and paste it (with perhaps a tweak or two because this blog doesn’t always paste code nicely into the VBE). And the really good news is that once you’ve saved this form, you’ll never have to change it again. It has worked well over all master files or code files I’ve seen without any modifications.
' The String must contain a valid SQL select statement with a "?" lblMessage = "No records found"
then did user select anything?
' If anything was selected, were done! "replaces just 1 character  '%' replaces many"
Today we will see how frmSelect is constructed. This is the basic form with the visual elements labeled. And here is a video that shows how to assemble these elements. Now it took a bit of time to create the video so please be understanding as to why this post is so short in terms of words. In the next post we will wire this up. frmSelect facilitates finding and selecting a record in massive lists by allowing the user to search by code/id/number or description/name (See video demo at bottom of post). Below is a screen shot showing someone searching a poorly designed customer master file. It looks and functions similar to another form I introduced months ago called frmSelect_Mulitple. This differs in that frmSelect only permits a single item to be selected. Selecting multiple codes makes sense when you want to filter a database and expect several records to be returned. It does not make sense when only a single item can be entered into a single field/column of a single record/row of a database file/table. So where as frmSelect_Multiple was introduced in the context of reporting, frmSelect is introduced in the context of data entry. Data entry often requires things like Country Codes, Employee IDs, Account Numbers, Customer IDs, Project Numbers, Status Codes, Contact IDs, etc. Excel natively provides means to select such items in drop down list boxes or combo list boxes. Those work great for small lists. They really don’t work for massive lists. So before we explain why, allow me a moment to talk about business databases in general. 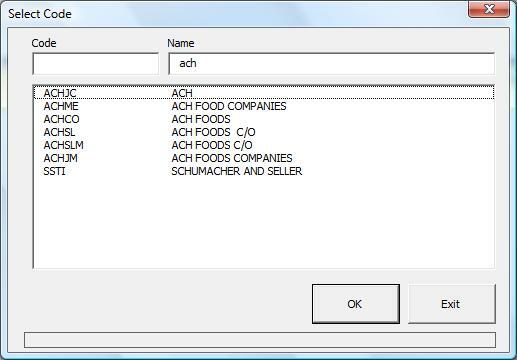 Transaction Files/Tables – These files contain things like purchase orders, invoices, checks, manifests, etc. They are usually divided up into a Header File/Table and a Detail File/Table. Header Files: These files contain transaction attributes for which there can be only one item associated to the transaction. Using an Invoice as an example, an Invoice can be for 1 and only 1 customer. It is issued on 1 and only 1 date. It has 1 and only 1 Invoice number. In this case, the invoice number should be the primary key. Detail Files: These files contain the many to 1 relationships. Using the Invoice as an example: there can be many items on 1 Invoice; there can be mutliple charges on 1 Invoice; there can be multiple accounts associated with 1 Invoice. In general, these files are keyed with the Header File’s primary key and a Line Item number. Master Files/Tables – These files contain things like people, places or things. They include Employee Masters, Customer Masters, Inventory Masters, etc. Master files, in my experience, all share something in common. They all have a Primary key field, and they all have a description field. Primary Key Field: Primary Key Fields are unique identifiers that never, ever change. Good primary keys for master files are ALWAYS numbers assigned by the system that have NO meaning what-so-ever associated with the contents of the record (The non-numeric abbreviation as the key to the customer master in the screen shot makes that file poorly designed in my opinion).Primary Key Fields are ONLY a means to uniquely identify a Master File record. Because master file primary keys never change, they are what should be stored in Transaction Files. An example might be an Employee ID from the Employee Master which must be recorded in the Payroll Checks Transaction File so we know who the check was for. We always want the key field and never the employee’s name because the name might change such as when an employee is married and that would orphan child records. Description Fields: Descriptions are what we, as humans, know people, places, and things by. For example, we know Fred Jones by his name, not his Employee Number. It’s possible there are two “Fred Jones” employeed at my company, but each one will have a unique employee number. For this reason, we must be able to find master file records by the description (what we know), and use the primary key field (guaranteed unique and unchanging) to identify a specific record. 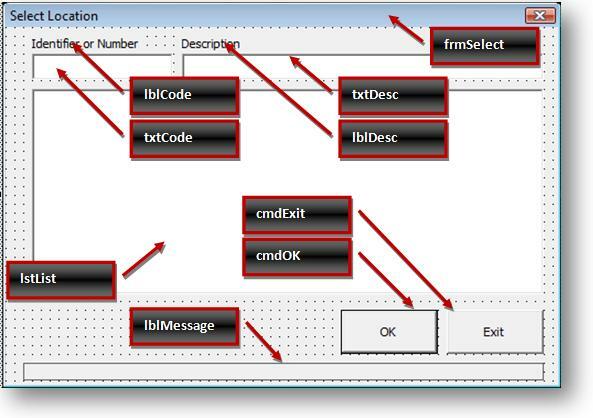 Code Files – These files are very similar to Master Files except the primary key has meaning. It’s usually an abbreviation that was accepted by convention. An example is “USA” as the code for “United States of America”. Another example is a General Ledger’s Chart of Accounts which uses a highly coded account number as the primary key. Like master files, the primary key must be guaranteed unique and unchanging. Unlike master files, we sometimes know the abbreviation as well or better than the name or description. Excel’s list boxes facilitate “begins with” searching of only one field in a list and, for small lists, they are faster. frmSelect facilitates “begins with” and “contains” searching of the primary key and description fields and, for massive lists stored on a server, frmSelect is overall faster. Since both Master Files and Code Files have a primary key and a description, frmSelect works nicely for both. The YouTube video below shows frmSelect in action. We’ll see how to construct frmSelect in the next post. DB_Lookup validates a code or ID against a database table. Where as XL_Lookup is meant for tiny code lists, such as States or Provinces that fit nicely in an Excel range, DB_Lookup is meant for massive lists such as employees, customers, or general ledger account numbers. Mere mortals such as we stuggle to memorize such volumes of data and so a means to search such lists using partial codes or descriptions is often a necessity. Search capabilities are welcome user tools and so it may seem unfair that XL_Lookup doesn’t offer them for the tiny lists in Excel ranges. That’s okay. If you really want to add such capabilities to Excel ranges, you can. DB_Lookup works with Excel’s ranges since Excel’s ranges can be searched by ODBC just like most relational databases. There are times, however, when we don’t want to offer DB_Lookup‘s search capabilities and so, we have a switch that allows us to turn that feature off, bUsePopUp. If bUsePopUp is set to false, the user will not be given the opportunity to select a valid entry; DB_Lookup will just verify the code or ID. This is useful when we want to perform a final check of all entries just before updating the database and we only want to know if everything is OK. If it isn’t, the user will get their chance to fix things later. DB_Lookup can connect to the database by creating its own private connection from a connection string, or by sharing an already existing connection object. I recommend using a connection object for speed in most cases, especially when checking scores of entries just before updating the database. Lastly, I want to mention the vbTextCompare constant in our Replace statement in the code below. vbTextCompare makes our Replace statement case insensitive so I don’t have to worry if “like” in sSQLCode string was all lower case, all upper case, or mixed case. Here is DB_Lookup. Next post will cover frmSelect.
' "Order by [Product Code] "
'                   "Order by [Product Name] "
.pDftCode = Replace(sCode, "? ", "") & "%"
DB_Lookup = """" & .pCode & """,""" & .pDesc & """"
Gets a result from an Excel range like VLOOKUP, but with more than just one key. Accepts any number of key values – not just three like Table_Lookup. Accepts relative column numbers like Table_Lookup when speed is more important. With this post I introduce a function that handles an unknown number of arguments/parameters so I’ll spend a little time explaining how this is done. Below is the code for our new function XL_Lookup. In XL_Lookup‘s declaration is a keyword ParamArray. (From: Microsoft’s documentation) The ParamArray keyword indicates that a procedure argument is an optional array of elements of the specified type. ParamArray can be used only on the last argument of an argument list. It allows you to pass an arbitrary number of arguments to the procedure. A ParamArray argument is always passed using ByVal. ParamArray is the only way I know to create user defined functions (UDFs) that have a variable number of values passed from Excel without using a range object. We can also use UDFs within VBA. UDFs that use ParamArray can be called within VBA with either a list of values (just as they are called from Excel) or the values placed neatly into an array. ParamArray basically takes any arguments/parameters to the right of the ParamArray keyword and stuffs them into an array with only 1 dimension. Since the argument/parameter is an array, you can determine the number of arguments/parameters sent by using the UBound function. ‘ Something didn’t match. Look again. One of the most common data validations methods is simple confirmation that a value exists in another table. If the data is in an Excel range, then VLOOKUP might be just what you want. Then again, it might not. Suppose you want a simple spreadsheet in which you log your time against projects assigned to you. Naturally, the data validation routine should check to make sure you only enter project IDs assigned to you and no-one else. That is a requirement VLOOKUP can’t handle very well. As a result I created a routine that can check just one key like VLOOKUP, or two or three. Actually, I created two routines. This is a case of program evolution. My first routine used column numbers to identify columns to search instead of column headers. Column headers are much easier to understand for us humans. So as things went on, I decided to wrap the first routine in a routine that translated column headers into column numbers before calling the original routine. Here is yet another opportunity for you to start afresh and eject some of the baggage I’m keeping to maintain compatibility with spreadsheets I’ve produced over the years. Feel free to rewrite these routines into just one. Just make sure to maintain the integrity of the inputs and outputs. This is the wrapper routine. Keep this function name and parameters intact. Merge the second into this if you feel energetic. As mentioned in the last post, I have chosen to use globals (variables that can be used by any routine in the entire spreadsheet/project) to keep the routines fast by eliminating repeated lookups for the same information. An alternative approach would be to pass lengthy parameter lists. You may want to do that in your code. I keep wrestling with that one and am tempted to rewrite the routines without globals. But that is for another time. “WorkSheet_Activate” assigns values to globals specificly for updating a speadsheet to a database. “Initialize_Globals” ” assigns values to globals that can be used for simply loading a database or updating it. These following declarations should go at the top of modTableLoad. modTableLoad contains those routines and data items required by spreadsheets that load data for databases. This includes database reporting/analytics spreadsheets and database update spreadsheets. The following routine is a handler for the activate event in the worksheet that displays records from and permits entries to the database. It MUST go in the worksheet (it cannot be in a module). The following routine should go in modTableLoad.